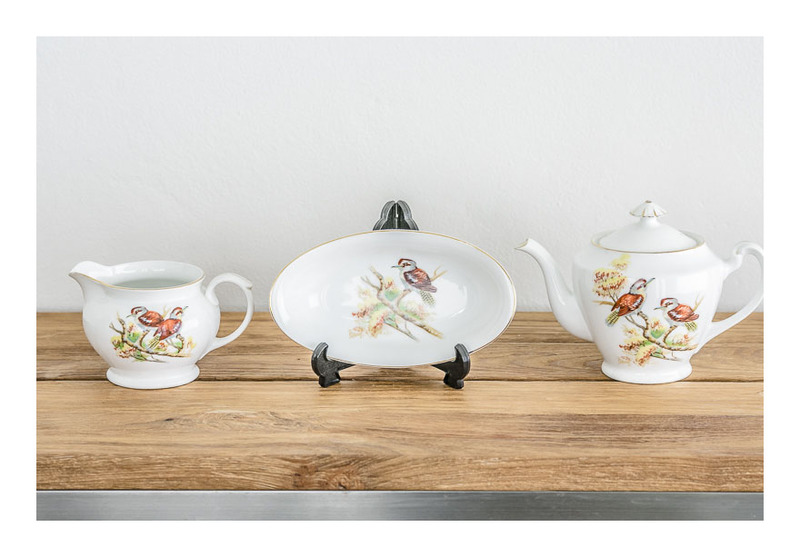 This is an image of our burgeoning vintage kookaburra collection: it’s in the kitchen- which is not the right place for a collection. It started off as a few delightful kookaburras among the serious kitchen utensils…a bit of kitschy interest to liven up the utilitarian implements…but ended up threatening to take over an entire shelf. The kookaburras here are mostly salt and pepper shakers, lustreware and handpainted pieces. There’s a rare Daisy Merton napkin ring in the middle: and a large kookaburra jug on the end. As the pieces might well be found in a kitchen you might say the display is warranted…I think this is an object lesson on what happens when a collector is given a bit of space. Whatever- as long as the espresso machine is not impeded I am happy. That’s the only implement in the kitchen I can operate and have any vested interest in. 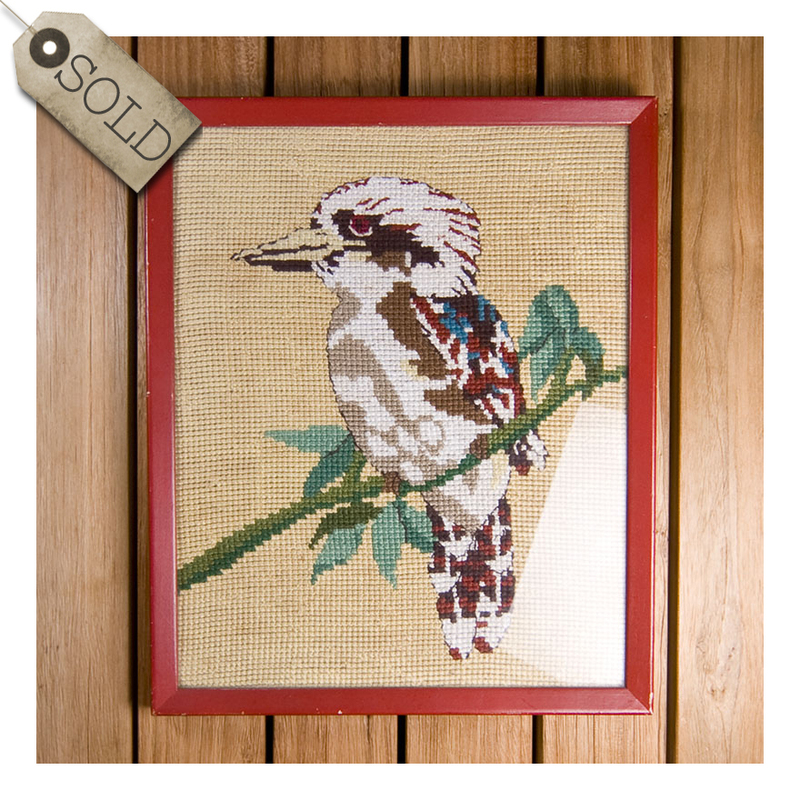 And the kitschy kookaburras are beautiful and somewhat ironic and thus make me happy. Souvenirware printed with a kookaburra or a kangaroo in Japan was exported all across Australia in the 40s and 50s; the ‘greetings’ handpainted by the recipient- not always terribly professionally- as seen here. I like the combination of the printed kookaburra and the naive handpainted greeting; it epitomizes Australia of this era. Taree is a small country town on the mid-north coast of NSW. It is an agricultural town, but that doesn’t mean that sourvenirware should necessarily showcase agricultural products. 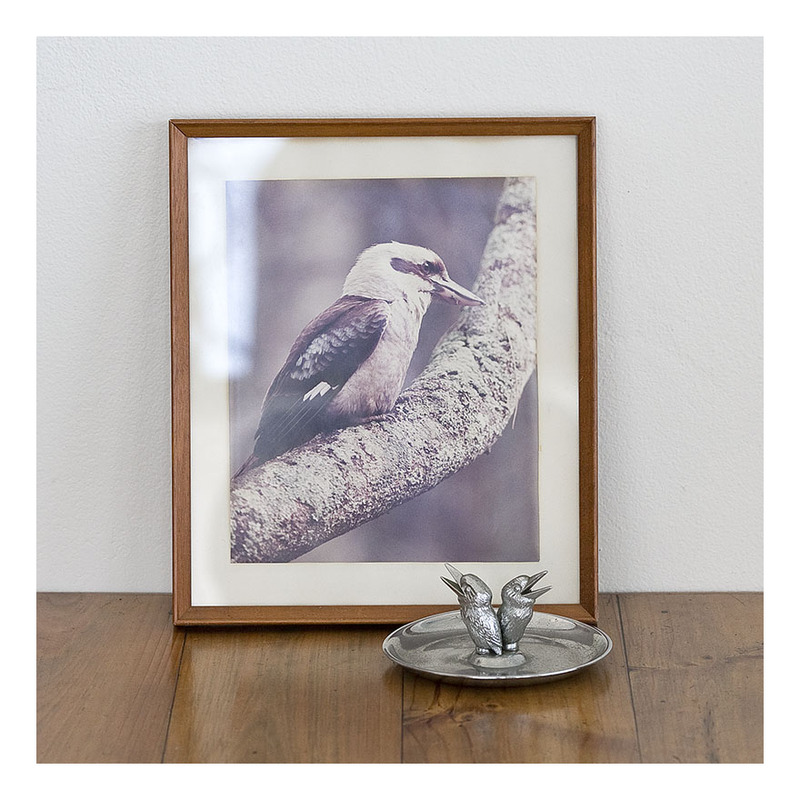 The kookaburra is an internationally known icon- and visitors wanting an Australian souvenir would be drawn to it. Only the name of the town changed! The 40s plate, marked ‘Made in Japan’ on the underside, has some subtle art deco stylings in the shaping, making it somewhat quaint. Altogether- a fine thing. My partner collects kookaburras and has wanted a Safe-Tee dish for a long time. She, like me, will not buy/collect anything to do with smoking….and we had both assumed this was a card or pin dish promoting some 50s company called ‘Safe-Tee’. So it was a joyous moment when we found the said ‘pin dish’ – a little dint in the chrome, but otherwise in good condition. I figured the kookaburra’s open beaks would hold business cards…but a little research later and of course- they were designed to hold cigarettes. It’s an ashtray by a company called Safe-Tee. Oh the irony. Of course, one can repurpose, and so one will. It’s a business card holder now. And still much treasured. These 30s tea spoons are by turns nationalistic, kitsch, and utterly adorable. The spoons are silver plated [ESPN] and very unusual- I haven’t found anything like them in my retro hunting travels. 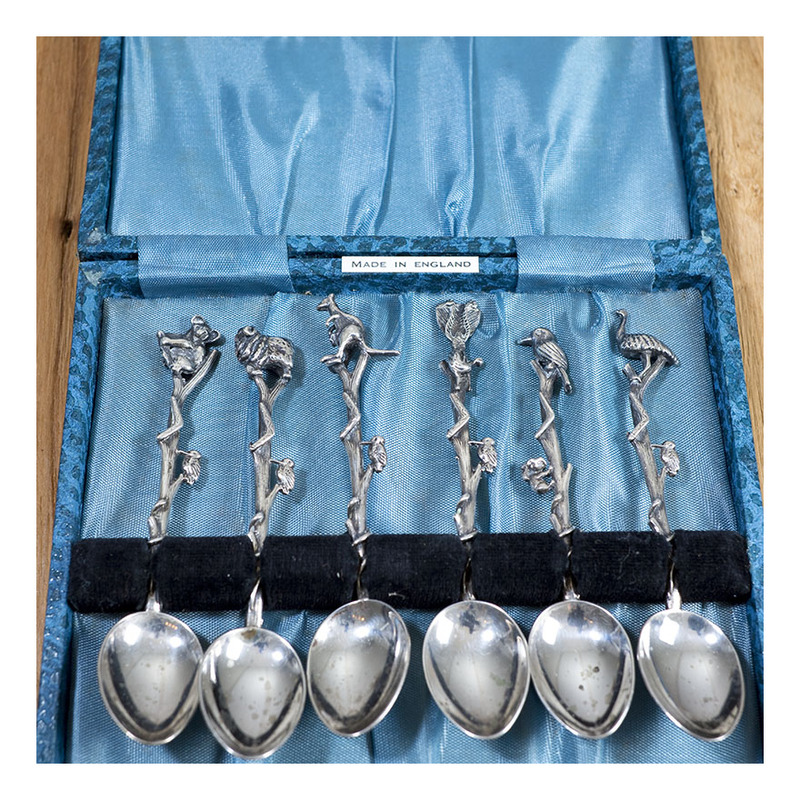 Each spoon is unique- very unusual for the 1930s; the spoon heads feature different Australian animals- koala, merino sheep, kangaroo, lyre bird, kookaburra and emu; – and the handles are asymmetrical, fashioned to resemble a branch and being adorned with boomerangs and either a kookaburra or a koala. And then the spoon bowls are all the same, as if the crazy handle was quite enough. Nationalism is all very well, but one must have a precise measure of sugar for one’s tea! 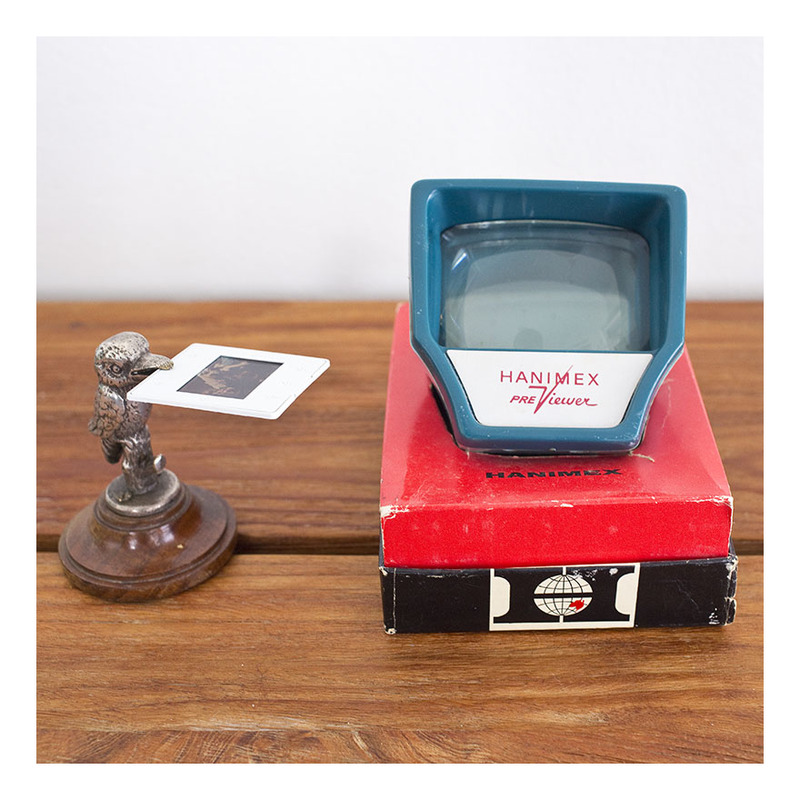 This Hanimex ‘Pre-Viewer’ was marketed as an accompaniment to the Hanimex slide projector- you used the pre-viewer to select [and work out which way was ‘up’] the slides before loading them into the slide projector. Of course, people who didn’t have a slide projector [and who could have afforded one in the 60s? except perhaps institutions] – used a pre-viewer as a slide viewer. Sure, it was laborious loading slides in one-by-one, but the instantaneous viewing was worth it. I’ve seen many people’s holiday snaps this way…although it does tend to cut down the quantity! This snazzy slide viewer comes in its original box. It’s that funky 50s teal colour. It uses batteries, and a bulb which is still available. It still works a treat. The kookaburra card-holder which is photographed with the slide viewer, however, is part of my partner’s collection and was just borrowed to hold the slide. It is not for sale. Kookaburras are SO collectible right now! And this framed cross-stitch is a beauty! I can estimate the date of this piece because I located the original Woman’s Day Craft Book pattern, which was produced by Lorraine Kloppman [Home Consultant] in 1970. Lorraine, you need serious editorial help! And a crash course in feminism. But – I am wondering if her expression ‘It’s time’ influenced the Labour political campaign of 1972…which successfully used this slogan to campaign on the need for change after 23 years of conservative government. Lorraine…I take it all back!